Old Town Square in Prague — Old Town Square is a historic square in the Old Town quarter of Prague in the Czech Republic. It is where the town started growing in the 11th century. 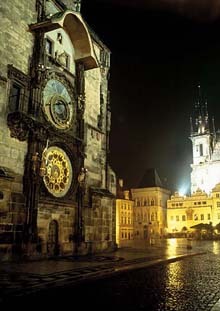 Featuring such various architectural styles, the square is an oasis for travelers wearied by Prague's narrow streets. Even a decade ago the Czech capital of Prague or the "Jewel of Central Europe" was an unknown place to most South Koreans. Only a handful of Koreans visited the Czech Republic. But in recent years the number of South Koreans visiting Prague has literally exploded. In 2007 a total of 100,000 Koreans toured Prague thanks largely to a local travel guru — Chairman Choi Soo-Myung of the Korea-Czech Friendship Association. Chairman Choi Soo-Myung currently serves as Korea representative of Czech Tourist Authority-Czech Tourism as well as Czech Airlines' Seoul Office. He is also vice chairman of the Association of National Tourist Office in Korea (ANTOR Korea), a body of 15 foreign tourist offices in South Korea. "Even back in 2005 only about 50,000 Koreans visited Prague," said Chairman Choi. "The number shot up two-fold in two years." He met with two of The Seoul Times journalists for a brief interview in his office in Seoul on April 1, 2008. He said nowadays a number of Koreans, particularly young ones, visit Prague, the capital of Czech Republic, as the Land of the Morning Calm become more and more globalized. Czech Republic attracts nearly 100 million tourists from around the world. Chairman Choi Soo-Myung — Chairman Choi Soo-Myung of the Korea-Czech Friendship Association is perhaps the largest contributor to the promotion of Czeck tourism among the local Koreans. 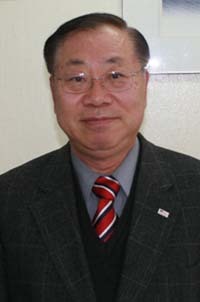 He currently serves as Korea representative of Czech Tourist Authority-Czech Tourism and Czech Airlines' Seoul Office. He is also vice chairman of the Association of National Tourist Office in Korea (ANTOR Korea), a body of 15 foreign tourist offices in South Korea. Chairman Choi has had a distinguished career at Korean Air for over 30 years. The last 12 of which he served as the vice president of its Pacific Rim regional head quarters. The benefits of such an international career include giving his two daughters a top-notch education, first at foreign high schools and later at prestigious US universities. In fact his daughter Choi Ji-Young has translated the new book about US Democratic presidential hopeful Barack Obama "The New face of American Politics" into Korean. As Chairman Choi proudly sits at his executive office in the Hyoryoung building just in front of the Seoul Finance Center in downtown Seoul with many accomplishments to reflect on, his current position as the Chairman of the Korea-Czech Friendship Association keeps him in his natural element as a proponent of international travel. "Every year more and more Koreans travel to Prague and the Czech Republic. At first Korean people would go to Prague only with a tour group," said Chairman Choi. "But in the last two years we realize that it is a safe, inexpensive and beautiful city. Korean travelers understand it is the kind of place you want to experience on your own." The Korean studies program at Charles University in Prague is beginning to thrive now, and there are five Korean restaurants in the Old Town of Prague which, Chairman Choi says, are nearly equal to the best Korean restaurants in Seoul. But when Koreans ask him about going to the Czech Republic, he always praises the Czech Republic for its gorgeous and mysterious capital city, Prague, its peaceful country side, kind people and of course for its world-class beer. "More Koreans are going to Prague now than Japanese. Korean students and travelers used to see Prague as a perfect gateway city between East and West Europe," He continues, "But because Prague is cheap with amazing architecture and down-to-earth people." Koreans are going to Prague and then just not leaving. There is so much to do and see there and with international food and the very low cost of staying there. "You can be in Prague and feel like there is no other place you need to be," Chairman Choi can vouch for that as there are not too many places that he hasn't been to. The writer, Scott Liam Soper, serves as staff writer and accociate editor. As a New Yorker he has been dedicated to covering and writing about a variety of cultural phenomenon in S. Korea and else where. Currently he is working on a novel.